Cobra Flight Pod air vehicles swoop down to attack G.I. 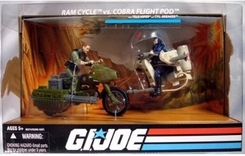 Joe forces riding Ram Cycles. Small in size but big in trouble, Cobra Flight Pods send a barrage of firepower raining down on the Ram Cycles – then the Ram Cycle drivers fire back full-force with their side-mounted gatling guns! These lightning-fast, rapid-fire motorcycles have gatling guns mounted on their sidecars for ground attacks that are swift and serious. A turbo-charged engine gives them their incredible speed, and they have ultra-quick response time, so it takes a highly experienced and really daring driver to operate them at top speed in the middle of a chaotic battle. SSgt. Rock ‘N Roll used a Ram Cycle to attack Cobra Island to rescue kidnapped scientist Dr. Burkhart, and they are often deployed to defend G.I. Joe base perimeters. Get ready to face-off in a fierce battle between good and evil with these awesome military vehicles! Slide the Cpl. Breaker figure into the driver’s seat of the Ram Cycle vehicle, aim the rotating gatling gun at the Cobra enemy and fire! Free-rolling wheels help your G.I. Joe comrade roll courageously into battle! A swing-down console on the Cobra Flight Pod vehicle puts you in control of the action as you team up with Tele-Viper figure and prepare for combat! A swiveling cannon and removable missiles let you take aim at the G.I. Joe team. The battle in on – which side will you defend? Vehicles come with Cpl. Breaker and Tele-Viper figures.